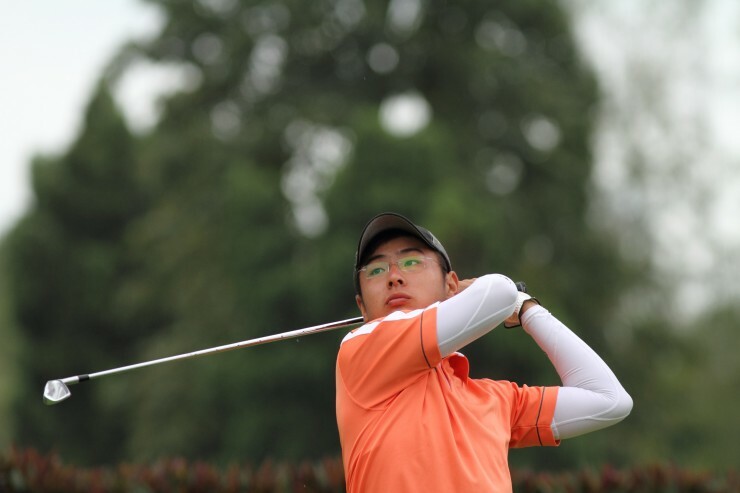 An outstanding birdie blitz of five-in-a-row propelled Wilson Choo to a career-equalling best eight-under 64 in the opening round of the Professional Golf of Malaysia (PGM) Tour’s LADA Langkawi Championship today. The Malaysian carded a bogey-free round at Gunung Raya Golf Resort in Langkawi that was matched by Thailand’s Nattapong Putta, and whose effort also had an eagle thrown in. The top-two led the field, with the new course record, by one stroke from Germany’s Torben Baumann, who posted a fine 65 of his own. Baumann’s round had an amazing nine birdies, which were offset by two bogeys. Another shot back was local amateur Low Khai Jei, showing the sort of form that has him touted as among the country’s future stars. Khai Jei shot an impressive five-under 67 and was tied for fourth alongside compatriot Syarif Yasin, Janne Kaske of Finland and Pasamet Pogamnerd, also of Thailand. Content with his blistering start to a campaign of trying to win a second PGM Tour title, following his only victory on the local circuit at Lanjut, Choo said everything “just clicked into place today. “I hit the ball well today and I putted well too,” said the Kelantan player, who added that he “learnt a few lessons” at last week’s Maybank Malaysian Open where he failed to make the cut with two rounds in the 70s. “I might have missed the cut at KLGCC (Kuala Lumpur Golf & Country Club) last week, but I did learn a few things that I think helped me today. The most important of this, I think, was staying patient and not over-reacting. Nattapong, who seeking a first pro win, said he was likewise happy with how he played today and looked forward to trying to keep the momentum going. Choo’s five-on-the-trot was almost matched by Nattapong, who strung together four birdies-in-a-row from the 12th to 15thholes. He also had an eagle to show for his performance at the par-5 8th hole. On a cramped up leaderboard, there was a seven-way tie for eighth on four-under 68 and 42 players in all who started with under-par rounds. The RM200,000 tournament is co-sanctioned with the Asian Development Tour and carries world ranking points – hence the huge international contingent in Langkawi.